PM Netanyahu orders cancellation of infrastructure work scheduled for Shabbat, accuses Minister Katz of causing coalition crisis. Prime Minister Binyamin Netanyahu on Friday ordered the cancellation of all the infrastructure work that had been scheduled to take place on the Israel Railways over Shabbat, and ordered the parties involved to reach a solution on the matter within 72 hours. In an unusually harsh statement, the Prime Minister’s Office accused Transportation Minister Yisrael Katz of trying to cause a coalition crisis with the haredi parties by ordering that the work be carried out on Shabbat. “Only a month ago, Katz met with the leaders of the haredi parties and promised them that there will not be any work on Shabbat. 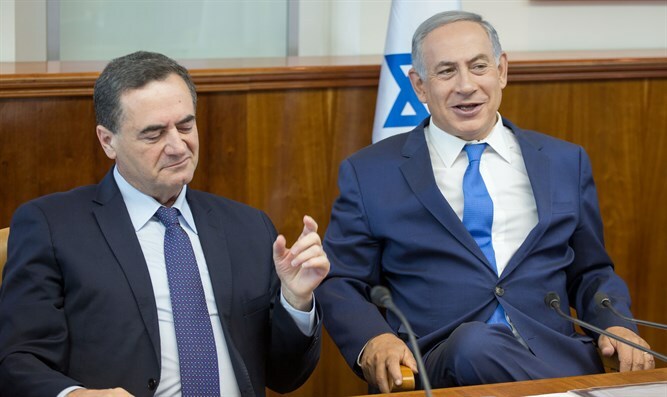 Shortly thereafter, after Katz failed in his attempt to take over the Likud institutions, the Transportation Minister stunned the heads of the haredi parties when he gave instructions to carry out dozens of projects on Shabbat,” said the statement from Netanyahu. “Katz argued that it was necessary to carry out the work on Shabbat and not on weekdays in order not to disturb traffic. But this claim is contradicted by the fact that Katz hid from the Prime Minister that he would soon be shutting down railway traffic for eight consecutive days, including weekdays. The downtime is expected to create many traffic jams and seriously harm the traveling public, including traveling soldiers,” continued the statement. “Last Wednesday, Israel Railways CEO Boaz Tfafrir announced that 17 of 20 projects scheduled for Shabbat can be postponed, while today the Prime Minister's Office and the haredi parties were shocked to learn that Minister Katz had instructed [crews] to carry out all 20 projects on Shabbat,” added the Prime Minister's Office. “There is no way to understand the Katz' actions, other than as a deliberate attempt to bring an unnecessary crisis with the haredim in order to destabilize the government. Apparently, Katz is trying to score points among the uninformed general public by desecrating the Sabbath and creating a crisis with the haredim. Minister Katz is intensifying a crisis of his own creation,” the sharply worded statement concluded. The statement is the latest episode in the ongoing saga of the railway infrastructure work on Shabbat. The haredi parties, Shas and United Torah Judaism, had issued an ultimatum last Thursday, demanding that Netanyahu restrict work by the state-owned rail company during the Jewish holy day. Giving Netanyahu 24 hours to comply, the two coalition partners threatened to bolt the government if their demands were not met. The Jewish Home backed the haredi parties. But the issue remained one of contention, with haredi MKs having this week criticized Katz over the Shabbat work and pointing out that the work could have been done on a weekday. Katz, for his part, insisted that Netanyahu was well aware of the extent of the railway work needed and actually approved it himself.